Being a city slicker is tough work. If you need to get away from it all, here are six distinctive resorts for a range of budgets and a range of styles. Tents on the beach, mud cottages near the Sunderbans and zamindari mansions — there’s something here for everyone. Solitary Nook located close to the Sundarban Tiger Reserve is the perfect balance of Bengal’s rustic beauty, simplicity and hospitality. Choose from 7 luxurious cottages to stay in – rates begin from INR 3,000. While you are there, we recommend you go on a bicycle tour around the village on bikes provided by the resort. They also organise jungle cruises and wildlife tours for groups. 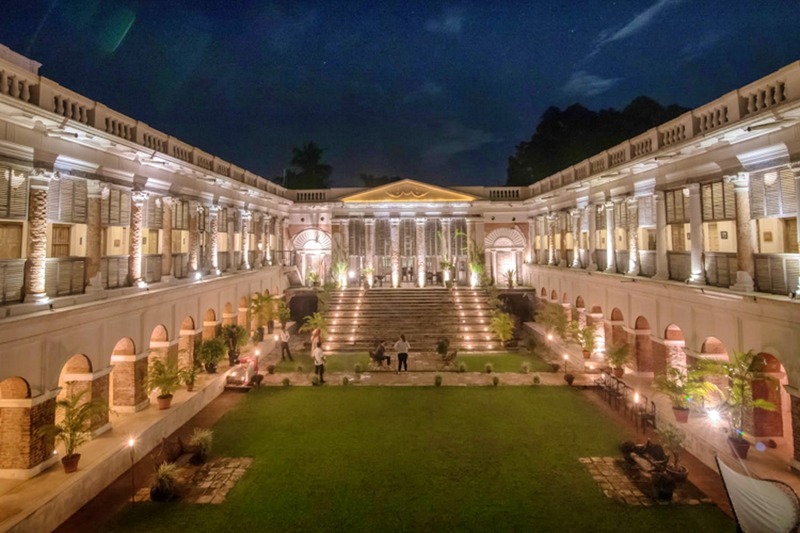 This gorgeous restoration project has recreated the style and grandeur of the zamindari life of colonial Bengal. The resort has seven types of rooms to choose from – classic, zamindari, chota bari, ashram and dak bungalow, with prices ranging from INR 7,000 to INR 13,000 per night. The high-ceilinged rooms have traditional four-poster beds, books and a few photos of film shoots that have happened here. You can go on village walks, cycle rides, or pick up cooking skills at the culinary demonstrations organised by the resort. Stay close to the peaceful beach of Tajpur, a hamlet in East Midnapore, laze around on hammocks, or on the silver sands, watching the sunsets. The tents here are spacious, neat and have attached baths. All the eating places here have delicious freshly caught and fried fish. Rooms begin from INR 1,000 for double non-ACs. Apparently this one is inspired by the Hawa Mahal in Jaipur. And has the same kind of natural cooling model. You can choose from an array of luxurious sea-facing cottages which begin from INR 3,000+. After a day at the beach, you can chill at the sports lounge which is equipped with a pool table and facilities for other indoor sports, or spend some time at the in-house cafe or their spa. Take a weekend break at Neel Kothi or Indigo House, a heritage home stay in a 200-year-old mansion in the middle of what used to be indigo plantations in the Raj era. Located in Nabadwip in Nadia district, it has 16-acres of orchards and farmlands around. The antique furniture, Lazarus snooker table, the antlers on the wall, and the vast columns will give you major Downtown Abbey feels. Rooms are INR 3,500 to INR 4,500 (per night for double occupancy, including breakfast). Indulge your latent brown sahib and play some snooker or billiards on the vintage table made by Lazarus & Company, or try your hand at darts, ping pong or carrom. Or take an early morning cruise on the River Jalangi. The name comes from the 1,600-odd palash trees on the estate. It is the perfect romantic getaway, especially in spring when the red trees are in full bloom. Tariff per night at Palashbari ranges from INR 800 to INR 1,000. You can choose from a variety of 8 rooms named after various trees. The resort offers packages ranging from INR 2,500 to INR 4,500 which includes local sightseeing.